I was excited when I was asked to be part of the blog hop for Lu Summer‘ new book Quilt Improv. It’s a delightfully colorful and playful book that focuses on Improvisational piecing of all types. And it’s extra fun to offer a copy of Lu’s Book to one lucky winner. I’m not going to lie…Improv piecing is difficult for me. I know, I know…it should be easier because there is no stress about matching points. It is freeing. But for a type A personality like me, I find myself a bit at sea sometimes. So a book like this is a perfect guiding point for me. It is full of plenty of eye candy and ideas. So I decided to tackle a project inspired by one of Lu’s Quilts, Farm Building. 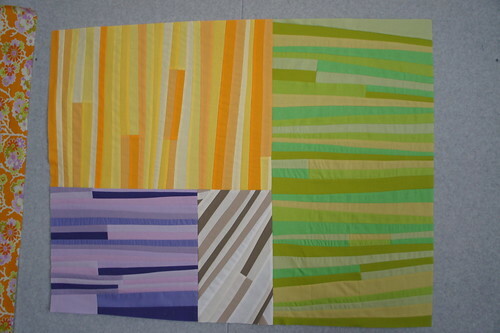 I was really drawn to the use of mixed solids improv pieced in particular. Lu has a helpful sketch too that was a good jumping point for me to design my own quilt. 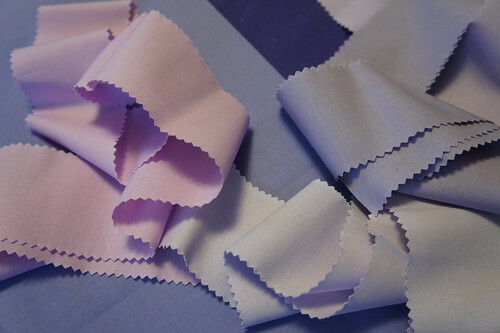 I started with purples…all solids (I set my beloved prints aside) and worked with tiny strips of fabric cut with very slight angles. I am probably the most rigid improv quilter out there, so I couldn’t let go of all control and just throw together the fabrics. I wanted balance with lights and darks, and that takes some thought for me. 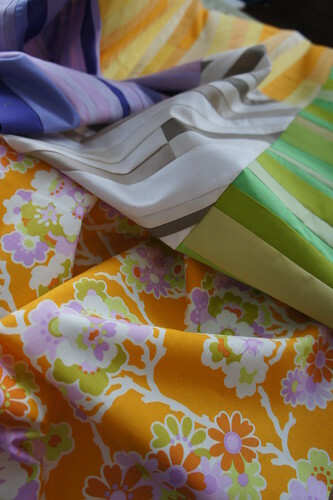 and then realized I had a beautiful Heather Bailey fabric that tied together my current colors and needed some more. So then greens came in and lastly creams. 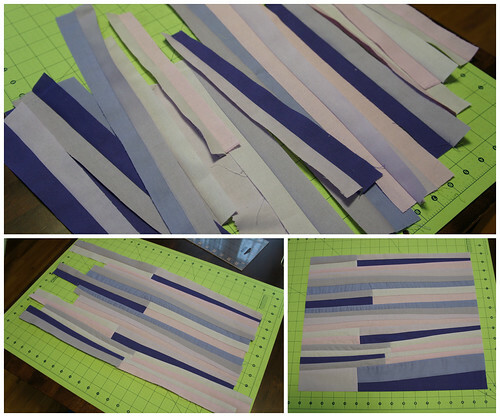 I deviated from Lu’s design by only using heavily pieced sections and not dividing it up with solids. It was just a personal preference of mine and how I felt my piece had the most balance. Quilting was a big decision for me, but with the help of pals on IG I got some ideas percolating. 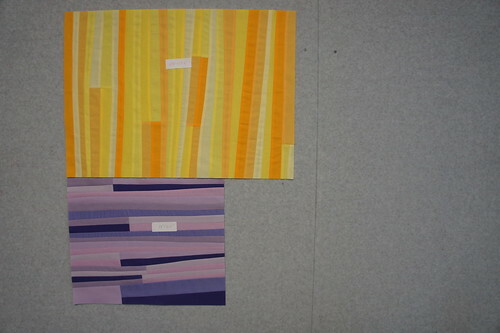 I ultimately decided on straight line improv quilting that was “perpendicular” to the piecing of each section. I quilted each section separately with a matching top thread. I didn’t want to lose the detail and interest of the piecing, and I think that this quilting is true to the nature of the piecing. Although admittedly once again, I was pretty planned in my “improv” quilting. Hey, you can’t change overnight! I bound it in the perfectly matching random polka dot which I love for adding a new shape (circles) to the visual of the quilt while also keeping all the colors pulled together. It’s a small quilt for me at around 36″ x 45″, but I didn’t want to overwhelm the piecing with too many sections. This way I can focus on each color and the subcolors. It will either be a wall hanging or a baby quilt. I haven’t decided where this one should end up. Suggestions?! Such a great little quilt!! Thanks for a chance to win. I love your choice of colours ! well done. I'm improvising on a quilt back today as I didn't have anything suitable and I'm trying to use rather than buy. I too struggle with the idea of improv quilting. I am a mathematician at heart and love symmetry. I have trouble getting out of my symmetrical world into an asymmetrical one. Improv would be a giant leap. But one cannot grow without trying new things. I am really liking imporve quilting and modern quilting no rules, and since I send out my quilts for quilting, using the technicques of improve and modern will allow me to quilt my own. Great job even it you were in control. I love it. I struggle with random, so I think I will struggle with improv, but I'd like to give it a go. I too find improv hard – but I shall keep trying! Thanks for the chance to win a copy of Lu's fabulous book! This book sounds like a dream for me, I'm rubbish at trying to improvise or make stuff up for myself, I'm a pattern or nothing girl. This book could be my saviour! I love the look but it scares the beejeebers out of me! You've done an amazing job and I think what you did was what Lu intended, rather than following her pattern, you made it your own! I think improv piecing probably takes some practice, I'm quite a planner too! What a fun quilt! Improv is hard for me also. I like everything planned out ahead of time. Congratulations on your controlled improv work!! (You sound like me…I really, really want to go free-style but how much risk can a girl take?) It is perfect that you found the backing material. Really a great finish! My only improv experience is wonky log cabins. I love those and would like to try some other things. Would love to win the book for inspiration and guidance. Thanks for the chance! Love your quilt, all solids was a good choice. Cute quilt. I think you should use it as a wall hanging. I love your quilt, especially the quilting! Very beautiful! I like what you did with the quilt. The quilting goes so well with the improv. 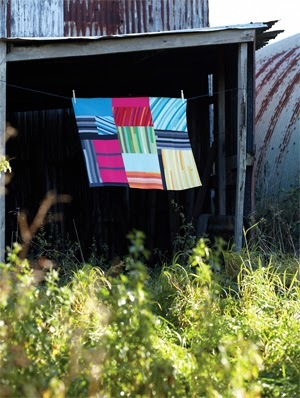 I think this quilt is very cool, and I immediately see so many variations you could do on it! The same style could be used with a monochromatic color scheme on a large quilt and be stunning, I think. Maybe it's something I'll have to try out. Thanks for the chance to win. 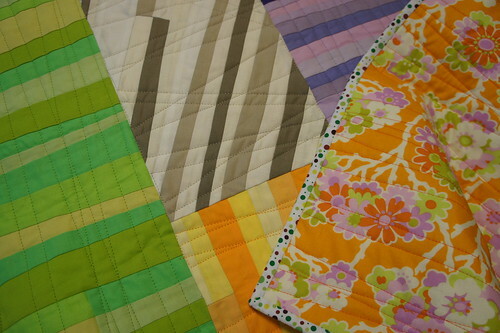 Oh, and I think a baby quilt — the vibrant colors would be great for a special little one. I'm very new to the improv world, so I love seeing the work of others! Thanks for the giveaway of this wonderful book. Wow, love the colors. And I haven't done any improv quilting it actually sort of scares me, so it would be nice to have a starting point and ideas in a book. Thanks for the chance to win. I need to get more improv in my life! Thanks for a chance to win Lu's book! What a fun, fresh, and modern quilt!! Love it! Vintage backing was a pretty choice! Beautiful quilt! I would love this book! I resemble your type A personality comment, big time. I need help letting go and letting the fabric take charge. Love your quilts! I know a book is truly inspirational when the reviewer actually uses it to make something! Love your improv quilt! Thanks for giving me a chance to win the book. Very pretty. The binding is such a nice touch, and the quilting was a great decision, I think! You did a great job, Angela! I love it. Oooh, love the colours in this! What a thoughtful post for the improv challenged among us. I have done one improve quilt (log cabin style) and it was liberating. Its fun just to piece with no rules. nice little piece of work! I love what you made! I am very much the same as you I like a little planning with my improv. Thanks for the giveaway! I've never made an improv quilt–I guess I'm just not an improv sort of person. But, I really want to be. I like your idea of easing in to it. That strategy might work for me as well. Thanks for the chance to win a copy of this book. I've been admiring this on Instagram. Love it! Nicely done!! I too struggle with improv and just going with it. You really found a nice balance to make it work for you. Very nice, Improv quilts are so fun and unique! I think controlled improv is a great way to start 🙂 and you've made it your own, which for me is the point of improv. I love your version, I could even see this working out really well as a QAYG project, as long as you have the panels made up ahead of time. Lovely Improv mini. Love your colors. Looks like a really fun book! And your quilt colors are great. And your quilt looks beautiful. I need to do more improv. sewing! 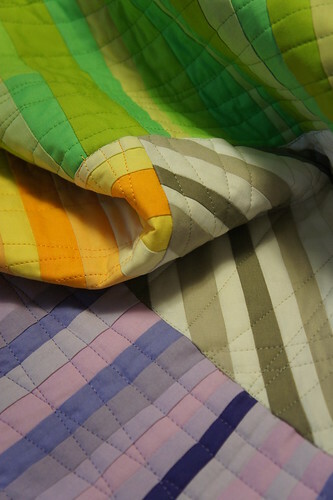 Your quilt turned out great – thanks for sharing & thanks for the chance to win. Would love to try my hand at improv quilting. Thanks for the giveaway. Oh my gosh, you sound just like me. I have been thinking about this book and you may have just sealed the deal. Your quilt is beautiful even if you don't think it was completely improv! Yay! I want this book so bad! I love improv quilting and would love to learn someone's tips! Nice work, Angela! You jumped right in! Wow! Your quilt looks so fun! This book looks A-mazing! Thanks for the giveaway! I definitely need help with improv piecing too – I really Really love your finished quilt – so simple but so effective! I'm right there with you on improv and the struggle to not be controlling everything. You did a great job letting go. Your quilt is beautiful! I'm really planning to challenge myself to use more solids and more interesting color palettes this year for my quilt projects. Great inspiration here! Always room for another great quilting book. Thanks! I love your improv quilt. I'm thinking I really need to get this book! As a fellow A-Type, I really like your controlled improv. Your improv mini looks amazing – love it in the solids too! I think you did improv perfectly . . . there has to be some planning or it wouldn't turn out stunning! Thanks for the chance. Just what I need as I have just started Patchwork and Quilting! good work! your improv quilt turned out beautifully! Pick me, pick me. Love your little improv quilt! 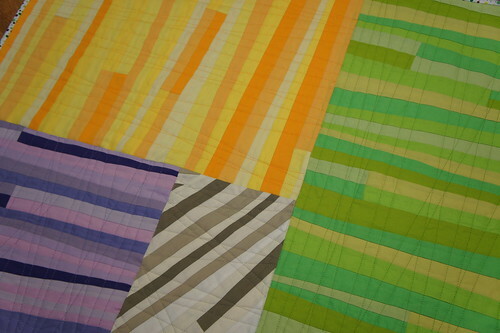 Beautiful quilt – the solids really let the pattern in the piecing shine. Thank for putting my name in the hat for this terrific book drawing. I've tried a little improv and enjoyed the process. Is love the book and the opportunity to try more. I sure could use the assist getting out of my comfort zone. Thanks for a chance to win this great book! I really like your improv quilt & like you, I'm not very comfortable with the whole improv thing but it is something I'd love to learn. Thanks for the chance to win a copy of Lu's great book. I love your quilt and I am sure anyone including me would love to win your quilt. I also would love to do something I haven't done before. Love all your projects. Your quilt is beautiful! 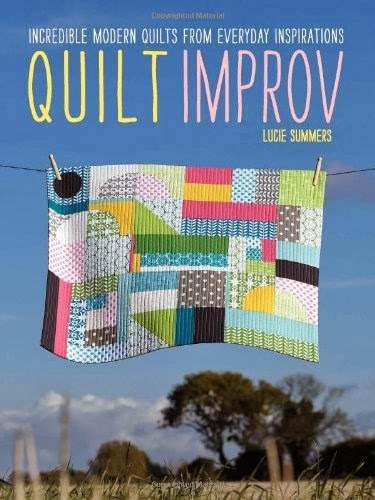 Improv quilting is something I'm just starting to play with so this book would be a great tool. The book looks amazing! Thanks for the chance to win and for all you do on your blog!! You did an awesome job. Looks beautiful. This looks great, and you have a fab choice of backing. Thanks for a fun giveaway too. I love improv style, not too comfortable with it, but I love it. This almost type A personality is challenged by improv piecing so I think you jumped off the diving board and did an excellent job. The problem with a wall hanging is you can't see the backing that goes so lovely with the front. Great finish. You took the plunge and the results are fabulous. Thanks for sharing and encouraging all us 'planners'! Love improv, but somewhat afraid of it. Like you, I just need to give it a try! What a lovely quilt! Thanks for sharing it. Angela, I took an improv class at QuiltCon with the wonderful Valori Wells. Her first instruction was to put away the rulers. SCARY! But once I got going, I loved it. Of course, when I got home I fell back into my old habits. 🙂 I do want to spend some time this winter working in improv, so this book would be just the inspiration I need! I love your choice of colors. I need this book as I would like to try improv piecing. I am like you. I want all my points to match but I see these quilts and love them. Your quilt turned out great! Thanks for the chance to win! Improv quilting is not in my comfort zone. I would love to win the book to help me out. Thanks for the chance. Wow. Improv quilting. I would never think of improv. Not just in quilting- I don't think I could improvise with much in my life. I'm inspired by your story above to try. Is it still improv if you plan it all out ahead of time???? I agree that improv can be difficult! Beautiful results and beautiful quilt! Your quilt is fantastic! I have never tried "improv", but think it is about time that I tried. Inprov is becoming my new favorite, thanks for the opportunity! Your improv quilt is gorgeous! I'm happy to hear I'm not the only one who has to plan and control everything 🙂 I guess the book would be a great help to me, too! Thanks for a chance to win. I am dying to improvise on a bigger project. It can be intimidating. Thanks for the chance to win the book! Wow. I love your improve. Great colors and the backing its great. Now for my question…you got the idea for the quilting from pals IG????? What's that? Or who is that? Wow! What a stunning quilt – you look like you have improv down pat! Love the colors and the quilting! What a fun quilt! Thanks for the chance to win! It sounds like it should be easy and fun to break the rules and do what you want, but improv does not come easy to me. I like the look of other quilters' improv work, but am struggling to find my own way to accomplish it. You did a great job on your quilt. How about making it a table topper or wall hanging? Quilting Improv sounds intriguing. Might be just the thing to get me out of my "box". Oh, I have so much trouble with these concepts. I would love to be more random and modern, but *gasp* it has to be balanced! Maybe someday! It's hard to let go but the quilts come out so unique. Your quilt came out beautifully! Enter me in the drawing for the Improv book, please! I could so benefit from this book. I am a very structured sewer and would love to "loosen up." 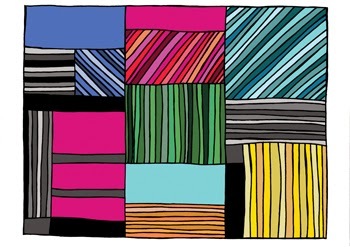 Thank you for sharing your way of making this improv quilt. I am inspired to give it a try! Gorgeous! I've never tried improve quilting, thanks for the chance! I love what you came up with. I'm excited to try some improv quilting! Beautiful quilt! I definitely need a little improve in my life!! Thanks for the chance to win this wonderful book! This book would be a great way to try a new technique. You did a great job on bringing it altogether and making a lovely quilt! Thanks for sharing. Great job on your Improv! Sounds like a lovely book! That is fantastic! Would love to try something similar. Looks like a lot of fun. Your quilt is adorable. Love your version of the quilt. I have just chosen this book as Part of the Library Project QAL. Can't wait to make it! I love your quilt! I love piecing so I need to let loose and try something like this, and your colour choices are awesome. Thank you for the giveaway! I love improv. Would love to have this book. Nice improv!!! That is fantastic! I completely identify with you on your quilting and hard to be open to improv. I see it and love it, but I don't imagine myself doing it. And look what you did! Inspiring. I love it. Great great job. Loved your quilt. This would be fun project. I love your improv quilt! It is amazing that you were nervous about these techniques – just gorgeous! HI LOVE YOUR IMPROV QUILT! I totally understand you being at sea sometimes with improv quilting. I'm totally with you and haven't even attempted it myself – YET! This would be a perfect book for me to give it a try. Thank you for having the courage to not only it a whirl but also to blog about it. You are a champ. Thanks for hosting the giveaway, too. I admire the way you balanced the lights and darks in that first purple piece. Beautiful! I'd love to see this book. Just the book I need as I have just started patchwork and quilting and am loving it! love it how you improv'd on Lucie's improv – exactly what she would want you to do. looks great too. i love Lucie's book. i look at the pages that Amazon displays repeatedly, and i covet covet covet it! Cool, cool book. I love the freedom of improv quilting. Awesome improv blocks. I love the slight angles. Wow, amazing quilt you have made there! So cool to see how the inspiration and the outcome. Hope it's not too late to toss my name into the hat. I, too, am a very rigid quilter, so I'd love to learn from Ms. Summers. P.S. Your quilt is sensational!! I love how your quilt turned out! I can't wait to get my hands on a copy of this book. Thanks for the opportunity! What a great book! And your work is gorgeous! The beiges. Takes my breath away. Gorgeous! I love the combination of green and oranges. Your quilt turned out great. I find improve hard to do but I love the effect and have been using it more often – practise makes it easier to do. I would love to have this book in my quilt library. Thanks for the chance! This looks like such a great book! I'd love my own copy! 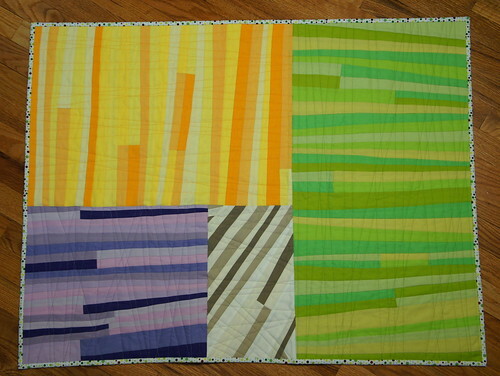 Adorable – I like your "controlled chaos" approach to improv quilting! You did a wonderful job. I would love to win a copy of the book. Thanks for the chance. Sometimes I cannot tell if a quilt is an improv quilt or not. I have seen many quilts that look like improv quilts, but turn out not to be and some that I didn't think were improv quilts and they turned out to be. So, I have come to the conclusion, it really doesn't matter and your quilt is nice. What a sweet little quilt you created!!!! Great job! It was fun watching your progress with this via Instagram. It looks great! Love your improv quilt. I've got to try this!